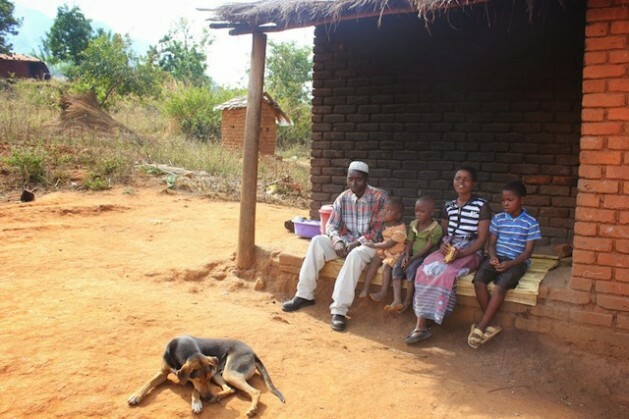 LILONGWE, Nov 20 2013 (IPS) - Gogo Munthali, from Rumphi, a village over 400 km north of Malawi’s capital Lilongwe, dissolves into tears every morning as she worries about what to feed her five orphaned grandchildren, the youngest of whom has full blown AIDS. “Samson may not be with me for long; he is on treatment and I can’t give him the food he needs,” she tells IPS of her HIV-positive grandchild who is four years old. Munthali was among the first beneficiaries of Malawi’s Farm Input Subsidy Programme (FISP) when it was introduced some eight years ago by late President Bingu wa Mutharika. About 1.6 million poor farmers were targeted and provided with two 50-kilogramme bags of inorganic fertilisers, hybrid and open pollinating maize seed at 50 percent less the standard price. The local village headman identified beneficiary families, and priority was given to households headed by children and women. Nationwide, the results were phenomenal. Maize output more than doubled in the first two years from an average of 1.06 tonnes per hectare from 2000 to 2005, to 2.27 tonnes per hectare from 2009 to 2010. This pushed GDP growth to an average 7.4 percent, higher than the World Bank recommended rate of six percent for sub-Saharan Africa. Inflation slid into single digits and food security at household level also improved. But today, the 65-year-old widow is desperately poor. She is unable to produce the crop yields she previously did. “Fertiliser, for the last four years, has been arriving late after the first rains … I have had to plant my crop three weeks late and this has reduced my harvest drastically,” she says. Rumphi, in Northern Region, is one of the country’s biggest producers of maize and tobacco. But this year, it is one of the 21 districts out of 28 nationwide that are affected by hunger. According to the government, 14.3 percent of the population of about 16 million will need food aid. Delayed arrival of subsidy fertilisers, poor access to financial services and markets, and unfavourable weather has compromised yields in Rumphi. Mary Juma’s story is no different. “We got so used to waiting for cheap fertilisers every year but now things have changed. [One day] we are beneficiaries, the next day we are not,” she says from Dedza district hospital in Malawi’s Central Region. When the FISP fertiliser was delivered to her area, it was well below the required amount and many families who qualified for the subsidy did not receive any. Her husband decided to borrow money from a revolving fund to purchase fertilisers at the full price. But a prolonged dry spell destroyed their crop, leaving them 400 dollars in debt. Tensions between Juma and her husband worsened when she gave birth to their third daughter and she says she left her abusive husband shortly thereafter. The untold stories of Munthali and Juma offer a glimpse into how FISP has failed to change the status of most poor farmers in this southern African nation, 70 percent of whom are women. This is a failure that very few here want to talk about because FISP has always been reported as having a positive impact. “The story of FISP since it was launched has always been about how it has helped reduce poverty … no one has bothered to find out what has really happened to the poor farmers being targeted. Are they well-off or life has become unbearable for them?” says Chris Chisoni, national secretary for Catholic Commission for Justice and Peace, which conducted a study in 19 districts to find out the impact that corruption in the FISP had on poor farmers last year. Wide scale corruption within FISP has played a huge part in the failure to change the lives of many farmers. An investigation into the programme by Malawi’s Anti-Corruption Bureau (ACB), conducted in 2007, which has not been publicly released but was seen by IPS, shows that the FISP nearly collapsed in 2005 after a preferred supplier from Saudi Arabia failed to deliver 70,000 mega tonnes of fertilisers on time. ACB found former Finance Minister Goodall Gondwe abused his office when he disregarded advice not to award the contract to supply fertilisers to a Saudi Arabian firm. Gondwe, according to ACB findings, went ahead and awarded the contract to the company, which only managed to supply half of contracted fertiliser and which resulted in a loss of 6.8 million dollars for the country. Gondwe, a former International Monetary Fund vice president for Africa, denies the allegations of wrongdoing. “The recommendation was that I abused my office but [the ACB] never proved if I had received any kickbacks as claimed. I dared them to take me to court if they had anything that could hold in the courts but they failed and therefore I was cleared,” he tells IPS. However, since no one was punished from the alleged misconduct, delays in the delivery of fertilisers have now become the norm. The report shows that the initial late delivery of fertilisers set the trend for how this southern African nation was to procure fertilisers over the next eight years. Overall, during the course of the FISP, many targeted farmers began receiving their fertilisers much later in the season, resulting in low yields. In many cases contracts are awarded to companies with links to the ruling elite and have no capacity fulfil their contracts. Early this year, current President Joyce Banda, promised to act and she did. The Ministry of Agriculture disqualified suppliers, both local and international, who were delivering the inputs late. This year, many companies have been disqualified and removed as prequalified bidders to supply fertilisers because they failed to pass the due diligence and other new stringent measures recently put in place. Principal Secretary in the Ministry of Agriculture Jeffrey Luhanga blames the former government for fuelling corruption that in the end affected the poor farmers. “This is a good programme with good intentions but failure to rid corruption has ended up in some bad results for the programme and punished farmers and made others rich,” he tells IPS. We ignore our fields, burn the organic matter, cut down the trees, leave the denuded soil to bake in the hot sun, and then when the rains come in December we turn to the government to provide the nation with chemical-fertilizers as a compensation for for all of this neglect. Nature provides readily available and free solutions to this cycle of dependency which so many local farmers now find themselves stuck in, but it will take an understanding, appreciation, and willingness to work with these natural cycles (rather than against them) if we are to see any true progress in Malawi.